Facebook is very popular social networking platform where most of the person spend his time on daily basis. Here we discuss about the Facebook Security tip how could you setup login alerts of unrecognized login at another device. Almost all smartphone users use Facebook and if you are one of them, then you have to know about the Facebook security tip. Facebook can let you know whenever somebody or even you sign in with your account on a device not recognised by Facebook. This can get really annoying if you log in using a lot of new devices all the time but most people don’t how to do that job. You can set up Login Alerts in your registered Facebook account in Privacy option under Settings & Privacy. When you get to the Privacy option just click on the Account Security and select Get alerts about unrecognized logins. You can improve your Facebook security of your Facebook account by getting an alert when someone tries logging in from a device or web browser we don’t recognize. These alerts will tell you which device tried logging in and where it’s located. 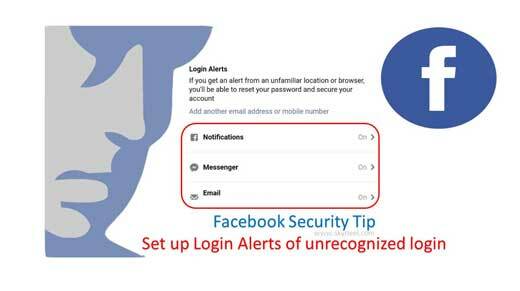 If you want to then you have to turn on your Facebook Security setup login alerts of unrecognized login then you have to take few given simple steps at your smartphone. Step 1: Turn on Facebook account at your smartphone. Step 2: Tap on the three horizontal lines. Go to the “Settings & Privacy” option > Choose “Settings”. Step 3: Go to the “Facebook Security” group and choose “Security and login” option. Go to the “Settings up extra security” group and here, tap on the “Get alerts about unrecognised logins”. Step 4: Choose where you want to get your alerts notification, such as from your messenger, email account. Here you can turn on “Get notifications” option and tap on the save button. If you found an alert from an unfamiliar location or browser, you’ll be able to reset your password and secure your Facebook account. During surfing on the Facebook, you’ll get different types of notifications at your smartphone or computer. Most of the person want to know how could they enable or disable Facebook notifications on chrome. In this tutorial we’ll discuss how could you easily turn on or turnoff Facebook notifications as per your need. You can locate everything from your last logged in locations in Facebook to a browser using a single settings. Facebook trace locations where you are login information on any smartphone or computer. Sometime we need to logged into your friend or other family members Laptop, PC or Smartphone to do this job, and forgot to logout. Most of person worried, if someone else has check or stolen your personal information from your Facebook account. Don’t worry in this guide we have to discuss an easy way to which you can easily track your Facebook last login location and also end the sessions at once.